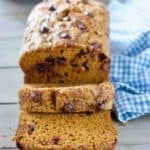 Pumpkin Chocolate Chip Bread! 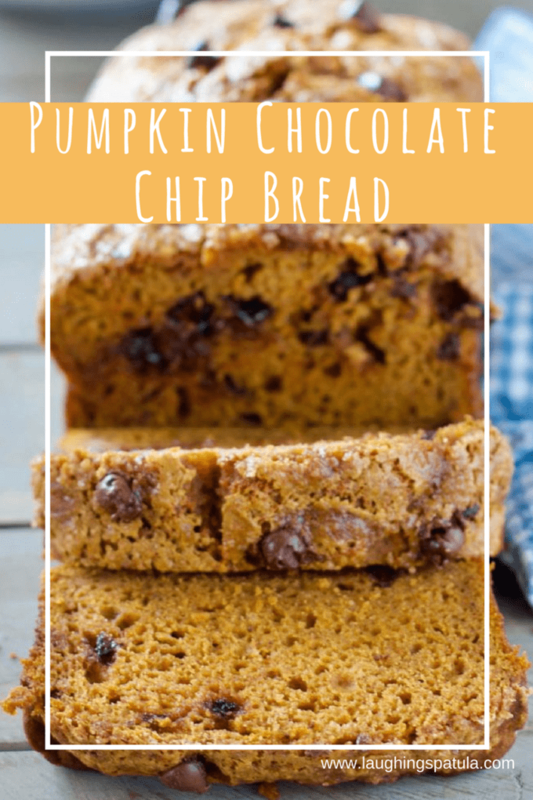 – Who knew chocolate and pumpkin was a thing…and that it is so good! Not gonna lie, the whole pumpkin recipe thing has been a little over done. I don’t buy into much of it, but I had a can of pumpkin puree that was sitting in the pantry calling my name. Cooookkkkk meeee! My pantry talks…it’s kinda cute. 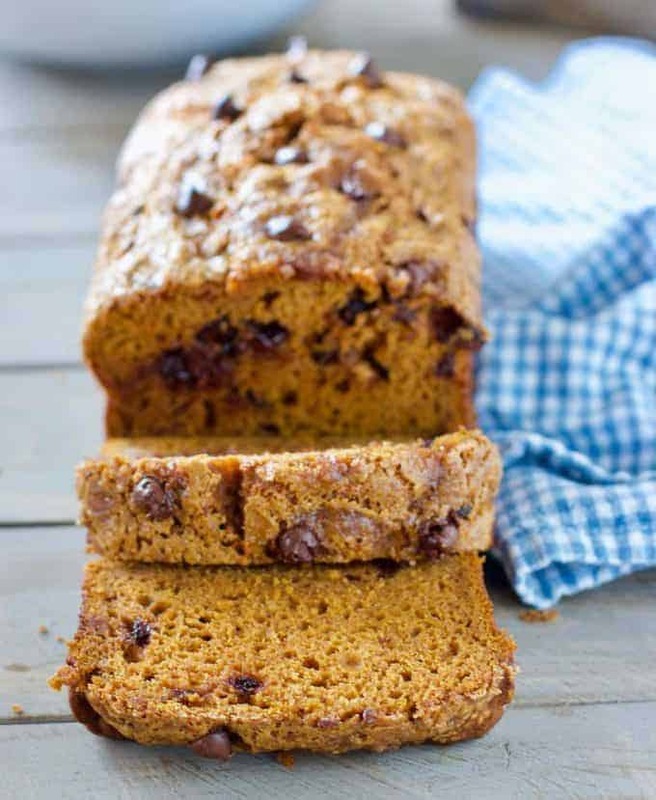 This Pumpkin Bread with Chocolate Chips would make the perfect hostess gift. Pumpkin and chocolate? Yup, I’m a believer! With the addition of pumpkin pie spice blend this not too sweet bread was over the top! I sprinkled it with a little bit of raw sugar to give it an extra crunchy topping. Like a lot of the stuff we make around here, we share. 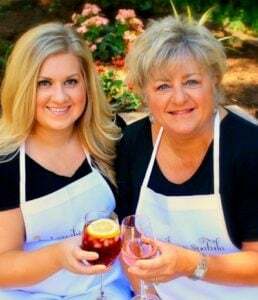 We have to, it’s just too much food around here if we don’t. This was a huge hit with our friendly taste testers! We also love to make and share this Easy Pumpkin Sheet Cake recipe with cream cheese maple frosting! (you can cheat and buy the frosting at the store and add the maple syrup). And this Pumpkin Cream Cheese French Toast Casserole with chunks of cream cheese running through it! This make ahead casserole is really special! To Pumpkin that calls my name! 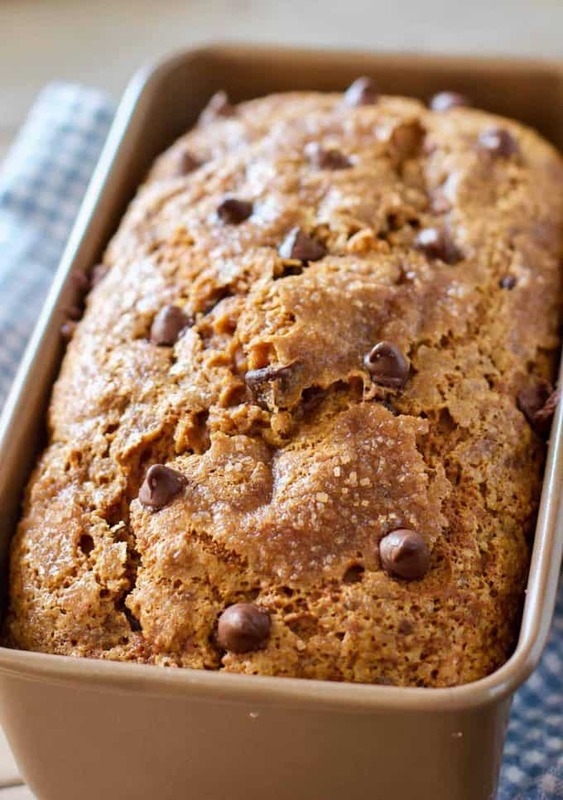 Pumpkin and Chocolate are a flavor bomb in this easy to make bread! Preheat oven to 350 degrees and spray a loaf pan, 9 x 5, with non stick spray. In a large mixing bowl, combine eggs, white and brown sugar, pumpkin puree, vegetable oil and milk with an electric mixer or by hand with a whisk. In separate bowl combine flour, baking soda, pumpkin pie spice and salt. Add dry ingredients to wet ingredients. Mix until just blended being careful to not over mix the batter. Over mixing can prevent the loaf from rising to its full potential!). Add all but a small handful of the chocolate chips and combine gently. Sprinkle remaining chips on top of bread followed by the Turbinado sugar (optional). Pour into prepared loaf pan and bake for about 50-60 minutes or until a toothpick inserted in the middle comes out clean. This also makes great muffins! Bake for about 20 minutes at the same oven temp. Because this bread is so moist it freezes really well too!